So do you have any kind of dust/water cover on the LED/low beam side now? And if not, aren't you concerned about dirt and water getting in there? No and not really. The high beam side never had any sort of cover to begin with, and the right side isn't any more exposed to the elements, so I don't imagine it will be a problem. That said, I do tend to ride in some really crummy conditions on roads that are less than paved, so it might become a problem at some point in the future. If it does (and I honestly don't think it ever will) I'll figure out some way to deal with it. Nice post. It is by far my biggest gripe about the bike also. Can't believe they even set it up that way. Miles, what is the HID like at night? Which brand and model did you get? Is that a Husqvarna supermoto in the background? I haven't had the chance to ride at night since I installed the HID, so I can't really say yet. It seems to be throwing plenty of light, but I can't judge until I get out on a dark back road. I got a 50 watt Morimoto Elite. I got it from http://www.theretrofitsource.com/. And yes, that is a Husky 450 SMR. A total blast in a self-abusive sort of way. Let us know if any of the surrounding plastics are melting after a while, please? How are the wiring connectors holding up too? I've seen other bikes stock & modified that melted the bulb holders & wires. I have a big ride coming up in a couple of weekends and plenty of it will be after dark out in the desert, so I'll really get the chance to evaluate things after that. Heat in the high beam projector assembly is a potential concern and one I'm going to keep an eye on. I'll report how it goes. This weekend I'm hoping to have the time to do the last piece of the puzzle- remove the low beam from the bike's main wiring system. I'll report on how that goes as well. I have really wrestled with running a lo-beam HID off the PDM60 (on full time), or just connect it to the OEM lo-beam connector? This won't accomplish the goal of both hi and lo beams on simultaneously, I realize that. My goal is more frontal visibility during day light hours. I'm also adding Denali DM Micro beams to the top front fender mount. I do very little night time riding. My thinking of connecting the HID to the OEM lo-beam circuit is IF I needed to turn the HID off, I can just switch to hi-beam. And I'm very concerned about the heat generated by the HID in the lo-beam assembly? I thought about drilling 1/4" holes in the perimeter of the housing cap to allow a little cooling. But not sure that would be enough? The other, less lumens option, would be to install an aftermarket Phillips Extreme Vision lamp (advertised as 100% brighter, I think we all know that's BS) in the lo-beam socket and run it off the PDM60 which will allow for both hi and lo beams on simultaneously. Speed has never killed anyone. Suddenly becoming stationary…that’s what gets you. 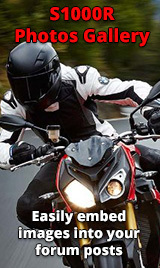 First off I would like to say that I have fitted HIDs to many of my bikes (both low and high beams) these include R1200GS, F650GS, K1200S, F800ST, F700GS, K1300S(in the UK and USA). The improvement in lighting has been nothing short of astounding. I have not had issues with any of these melting housings or causing any CanBus errors. I may be looking at this in a far too simplistic way, but 50 watts is 50 watts, this is dissipated in 2 major ways (as far as light bulbs go) light and heat. so if a bulb is deemed brighter surely it can't also run hotter?? when running at the same wattage. I guess there could be some inefficiency in there but how much would that account for?? let me know if I am missing something here? ?